Pho is one of the most delicious dishes you can find wherever you go in Vietnam. Pho is one of the most delicious dishes you can find wherever you go in Vietnam. If you’re planning a trip there this autumn, whether for your honeymoon or to get away, then you should know how to eat this delicious noodle soup. Want to know more? Here you go. 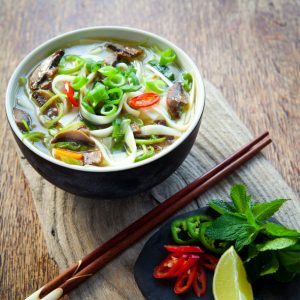 Pho is a popular breakfast item across Vietnam, but here in the west, it’s more commonly consumed during lunch or dinner. But now if you’re walking down the streets and alleys of Hanoi, you’ll find vendors that are open all night and people that are enjoying it no matter what time of day it is. So, this leads to an important question: just how exactly is it made? The broth, noodles, vegetables, and condiments all come together to create something incredible. Although you’ll often find meat offered in your pho, the meat is supposed to be cooked separately and layered in on top right before it hits the table. Once you’ve got a bowl of pho in front of you, it’s time to dig in. You’ll need to use the chopsticks and the spoon together, much as you would use for other Asian-style soups. Pick up the chopsticks with whichever hand is stronger, and then hold the spoon in your off hand. Sip at the broth to appreciate the meat and the flavorings cooked into the broth: these flavorings include ginger, cinnamon, and star anise (yes, the same flavoring that gives licorice its distinctive taste!) Don’t be afraid to slurp up the soup – you won’t be seen as rude! You can also choose to add some lime juice, fish sauce, or some pepper if you like. If you’d like to have Thai basil, green onions, cilantro, and bean sprouts in your meal, you can add them too. Just be sure to rip them into smaller pieces before dropping them into the bowl. What Are Some Different Varieties? Pho Cay: this is also beef, but it is much spicier than its plain cousin. Pho Hai San: Surprise! This is pho that contains seafood. Pho Tai: Another type of beef noodle soup, only it includes beef fillet that has been left rare, where the meat is seared on the outside with a cool red center. This entry was posted on Friday, October 5th, 2018 at 12:00 pm . You can follow any responses to this entry through the RSS 2.0 feed. Both comments and pings are currently closed.